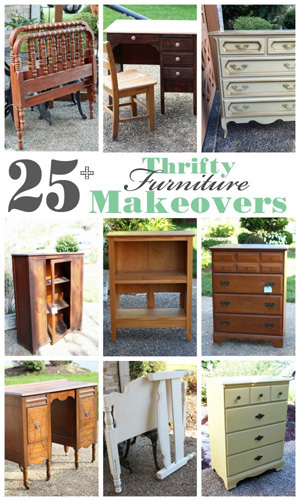 Beautiful friends, I have another cheapie thrift store makeover for ya’ll today! It was only $6 so I really couldn’t pass it up. It originally had hinges on either side that probably attached to two smaller mirrors on either side, and sat on a dresser. I removed the hinges and filled the holes several months ago and this is how it has sat in my storage room ever since. 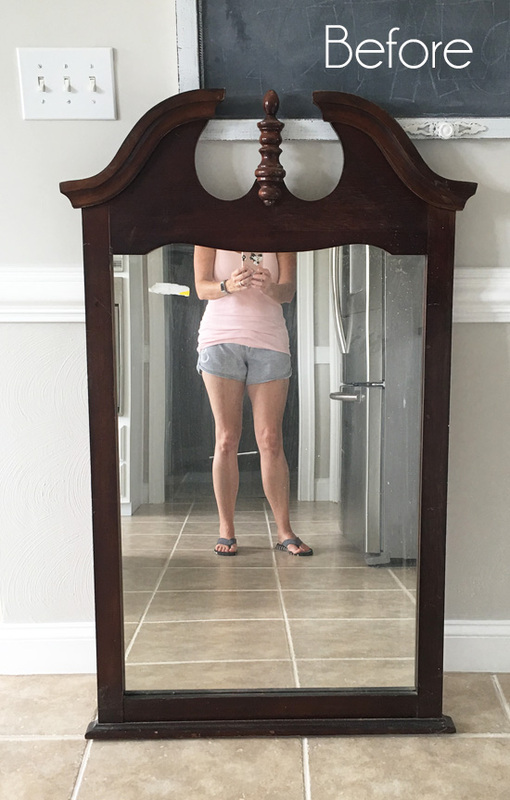 This mirror would be perfect atop a table in an entryway to collect keys, leashes, hats, etc. This would also be great for a dressing table. It’s pretty cute on the wall here in my office with my sofa table I stole from the living room! Read more about my office feature wall HERE. 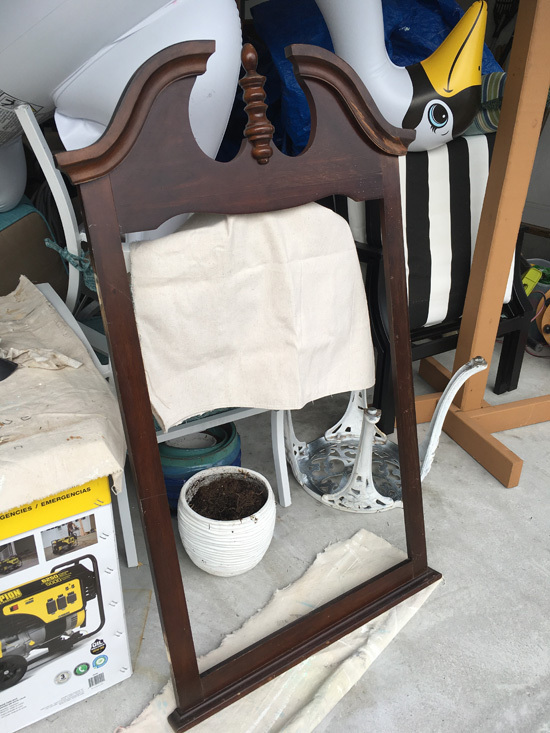 It is so much easier, and I can paint the back of the frame as well so the mirror won’t reflect the ugly brown. A quick spray of Rustoleum’s Clear Matte spray (affiliate) sealed those tannins in perfectly, and I was able to continue painting without issue. 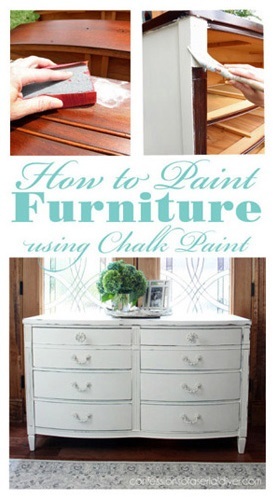 I used Behr’s Bit of Sugar made into DIY Chalk Paint (recipe HERE) for this one. It took three coats. A quick sanding followed by a coat of Annie Sloan’s Clear Soft Wax and it was complete. I hope you enjoyed this simple update! 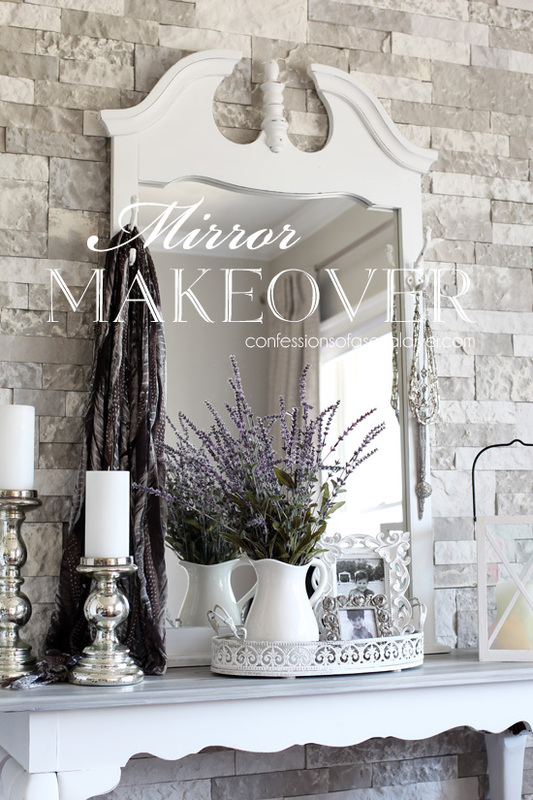 If you liked this makeover, you’ll enjoy this one too! 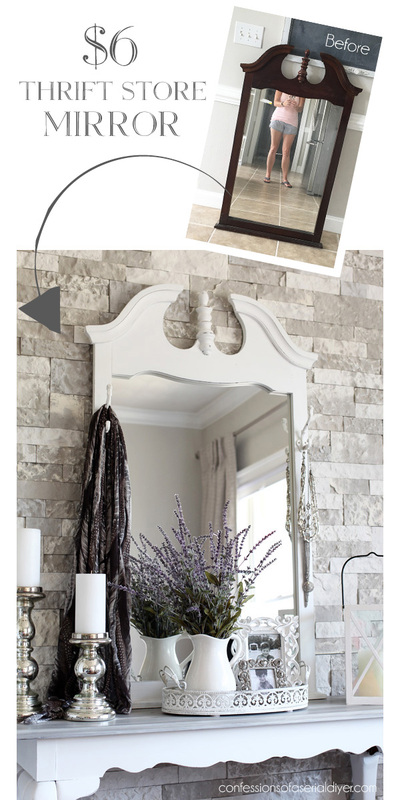 See how I repurposed this mirror HERE! 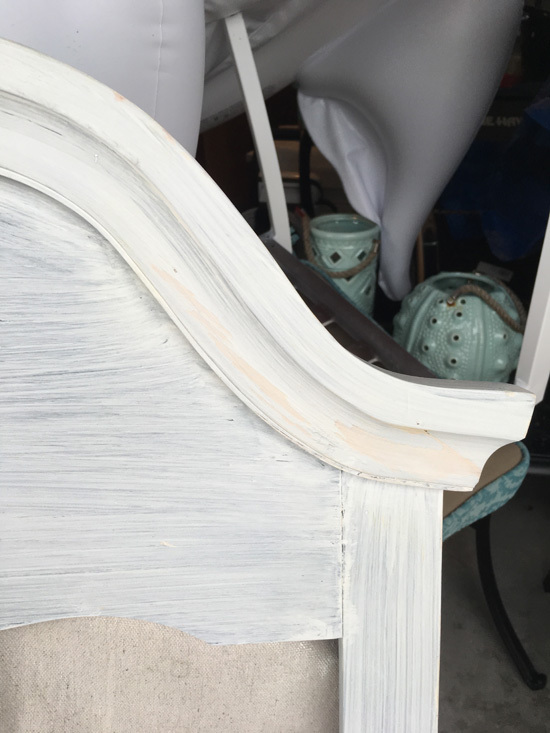 UPDATE: See how I repurposed this headboard HERE now! That turned out fantastic. 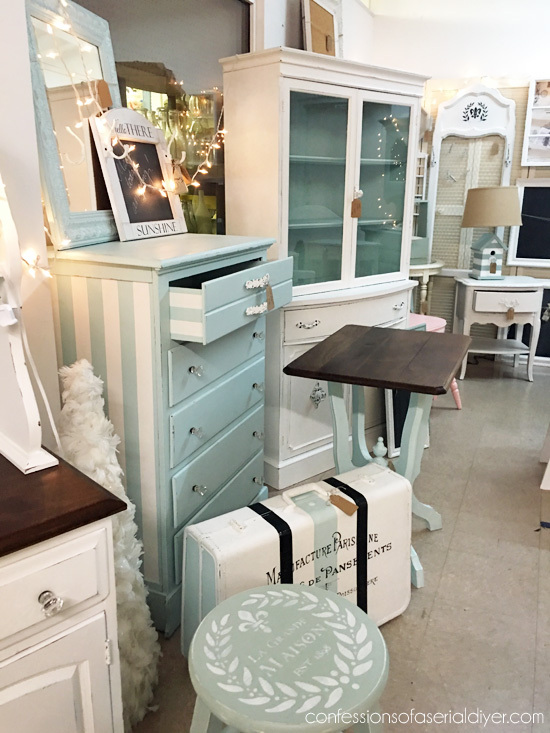 It is amazing what some white paint will do to make a dated pieces so fun and fresh looking. I love it. Can’t wait for you to do another “Thrift Store” tour! You do good work. Why does white make everything look so much prettier? Also, I need to paint the 2 gold/mirror jewelry trays I have. Did you keep the mirror on the bottom or did you paint over it too? It seems that you survived “Florence” I’m glad to see! I have family in the Carolinas and we heard they were safe and sound also. 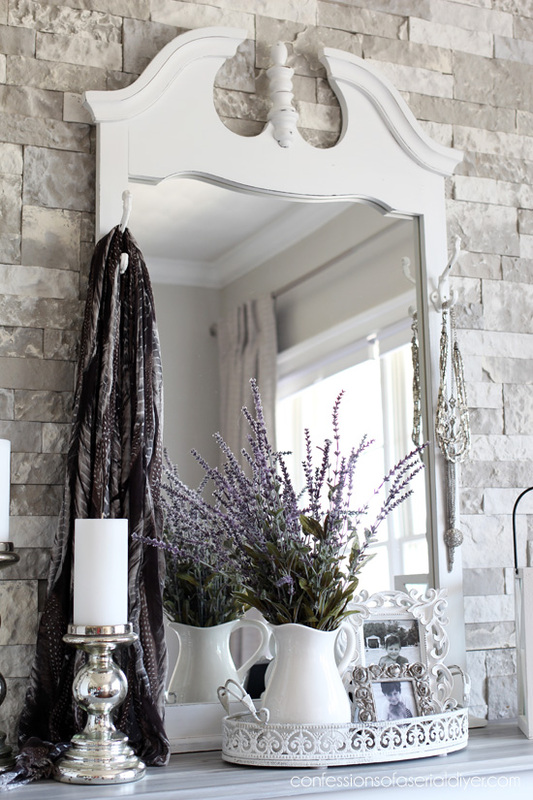 I love what you did with the mirror! And those hooks were the perfect touch! I have tried my hand at making a drawer for my TV cabinet turned kitchen island and I’m happy to say it turned out great! I have it posted today if you’re interested in seeing the results. XOXO my friend! 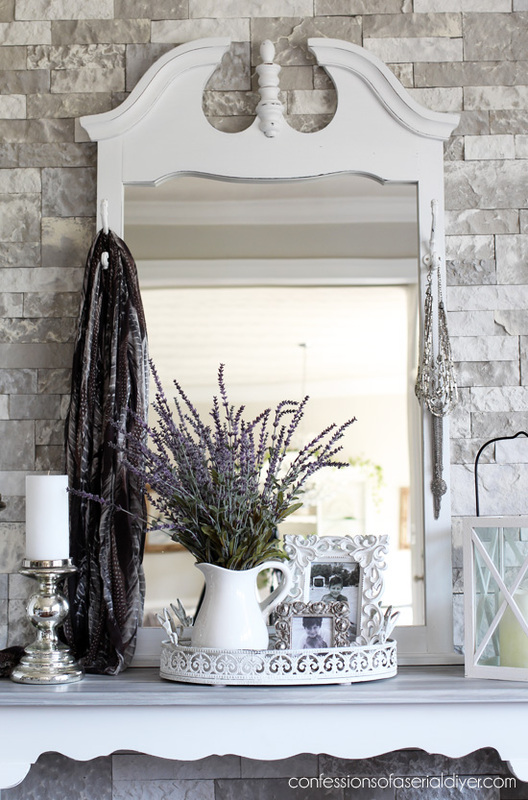 I love that style of mirror! 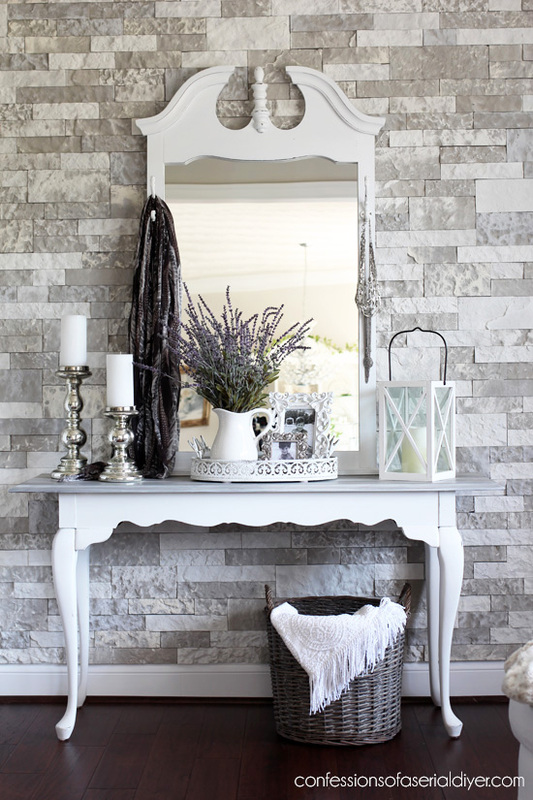 It does look great atop your sofa table too; I can just see that in an entryway! Beautiful! Hope you weathered the hurricane without any issues. It’s beautiful, I love it! You always surprise me with what you do to a piece. 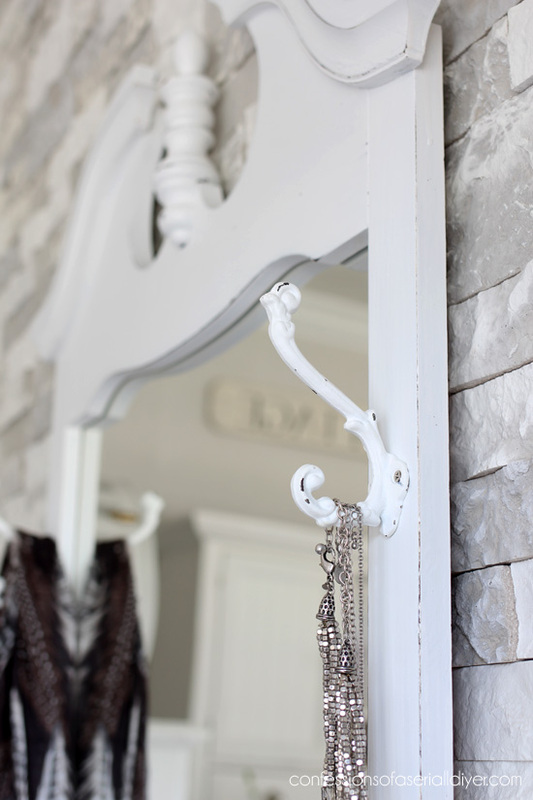 I especially love the idea of the hooks on both sides of the mirror. It really dresses it up and gives it character and function. Thank you for sharing your beautiful work. Dang, I threw one like this away when we moved last year. Wished I’d had the vision you did with it. I love the transformation! I am sorry you had bleed-through but it is nice to see how you fixed it. I have followed your suggestions from past posts and everything you share works great. It’s nice to see options. I hate bleed-through more than any other problems. Thanks for a cute and easy idea. Such a lovely yet simple transformation. Your mirror is so pretty now! I have one I’m wanting to paint, but I have to decide on the right color. You just keep inspiring me! 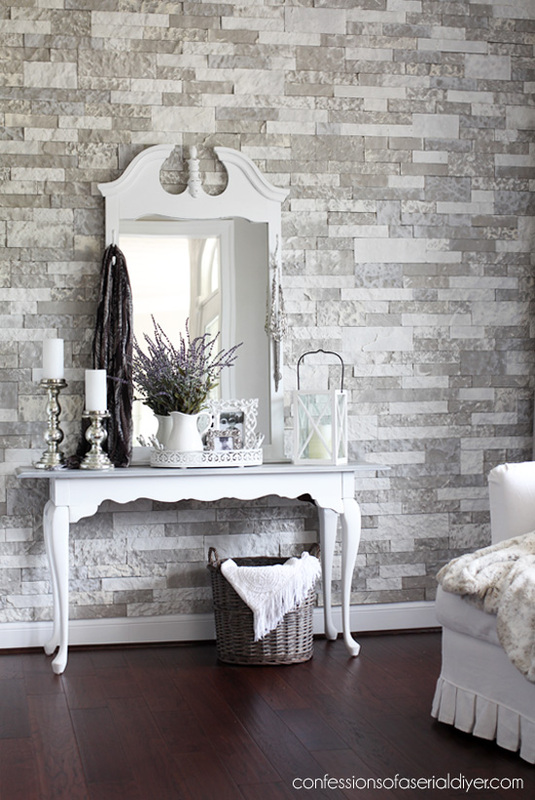 Wow…what a pretty make over and it looks so amazing on that rock wall…..which by the way I totally love that wall. 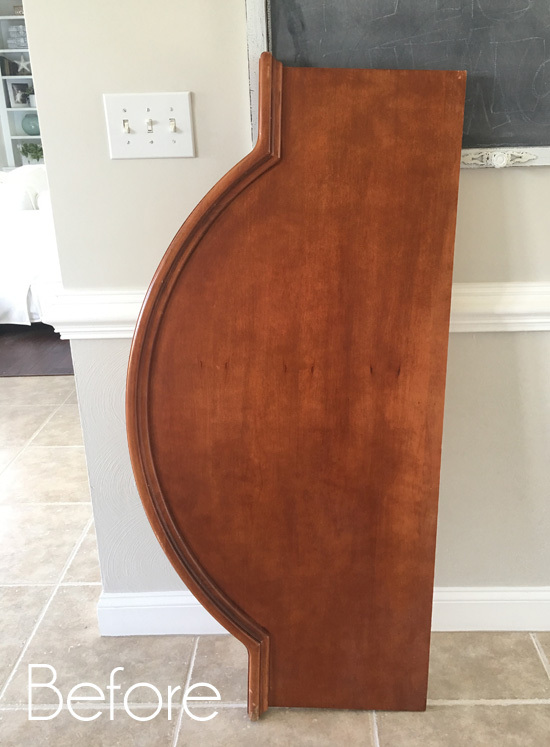 Beautiful job on this mirror. 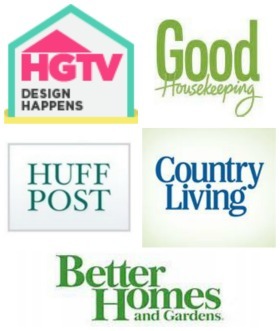 I always dreamed of having a entryway but, alas have never had one. 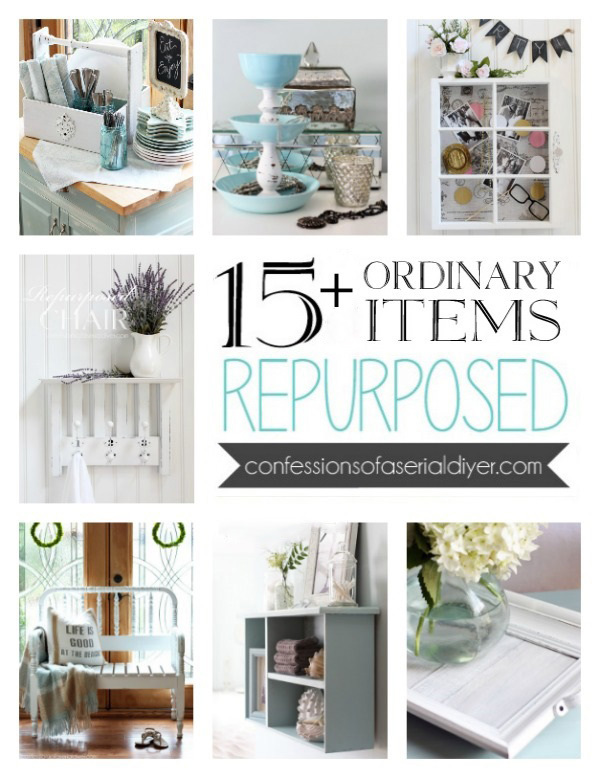 I have a board on my Pinterest dedicated just to you lol so this will be added. Hugs! 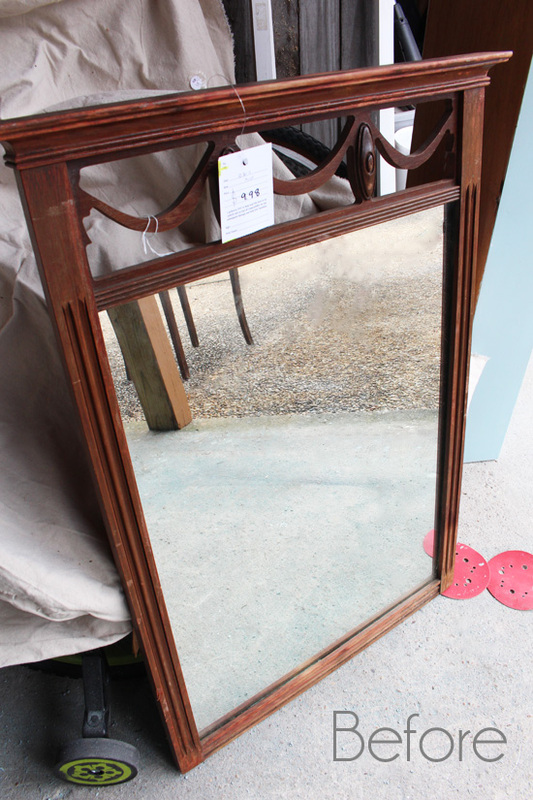 I have this mirror, solid maple, very heavy bought with my son’s Roxton bedroom furniture for his first Big Boy Room in 1977. It’s in perfect condition as are the rest of the pieces that are being passed down to our first Great grandson for his Big Boy Room. I’m keeping the mirror and may try this repurposing.